- Do you lend money to other people? Sberbank does. Loans are an important element of our daily routine. I don’t. I stopped lending to others a long time ago. Especially to friends. I don’t lend money because I don’t want to spoil relations with them. In the past, I did lend my money to other people, and several times, I shared literally everything I could afford only to never get my money back. In the meantime, those people kept contacting me as if nothing had happened. Of course, that was unpleasant. Not that I regretted the money I’d lost very much. I rather felt upset at the thought that some people could behave in such a way that just does not add up with my notion of what is right and wrong. You either don’t make promises or do your utmost to keep your word. With time, I began to take a more tolerant approach to such things, but at the same time, I stopped lending money to people a long time ago. Let me put it this way, I regularly help people who’ve gotten in trouble, but I never expect them to give the money back. - In other words, you give gifts. No, I just don’t expect a return. That’s the point. I give and forget. It’s easier and more proper to have it this way. If I have some doubts, I prefer to say no right away. As you may have guessed, it’s rather hard for me to say I’m broke. Nobody will believe me anyway. So, let me be frank, I would like to know first off why I’m being asked for money. In our family, it is a custom: share what you have with others by God’s grace. We constantly donate to charity. We spend our own money to support educational projects. First, several of our partners and I support an educational center in Moscow’s Khoroshovo neighborhood, called Khoroschool. Also, there have been many one-time projects which we discuss within the family. 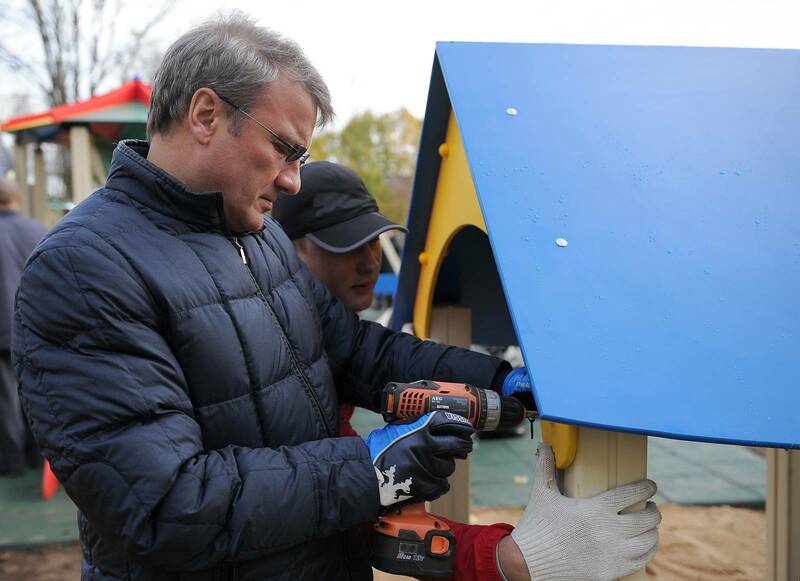 Incidentally, Sberbank takes care of more than 160 orphanages. I go there not only with my family, but with my colleagues, too. We pick a weekend and go there as a team, usually on Saturdays. Each time, we purchase something necessary and useful with our own money. Last time, we brought equipment for an outdoor sportsground. It was delivered as a do-it-yourself kit. We assembled it together with the kids. In the previous years, we purchased books for libraries when somebody had told us there were not enough books for children. On another occasion, the automobile manufacturer GAZ agreed to sell us minibuses at a discount. We purchased 20 Gazelle vans and distributed them among orphanages. It was not a Sberbank-sponsored project but a private initiative. - So each donor contributes as much as he or she deems necessary? 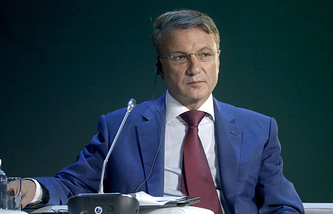 Honestly speaking, we’ve established a bottom threshold for Sberbank board members. If you can give more, you are welcome, but you cannot donate less than a certain amount. 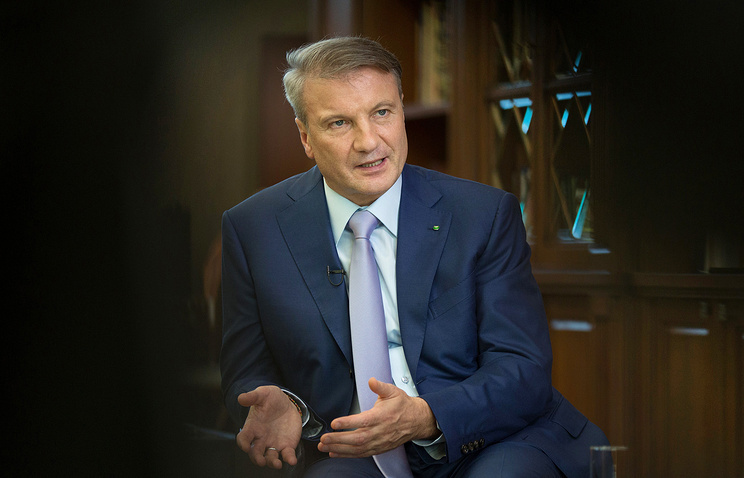 Sberbank has created a charity fund called: “The Contribution to the Future”, whose mission is to support Russian education in light of the challenges of the 21st century and to promote an inclusive environment. The fund helps introduce new technologies, knowhow and solutions for giving trainees knowledge, skills and abilities crucial to our volatile world. We have more than 100 partner charity funds that we cooperate with on a permanent basis. They’ve been through our due diligence procedures. We could see that their administrative costs are low, reputation is impeccable and activity transparent, and that all the funds they get are spent properly. 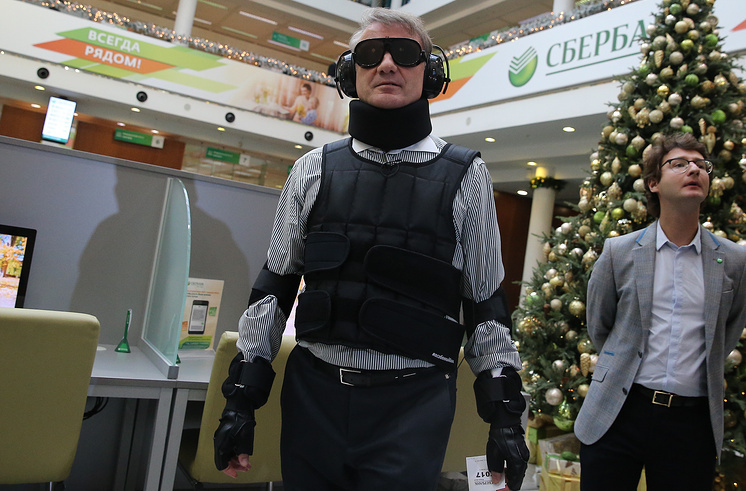 In 2018, Sberbank arranged for an education tour by our remarkable musician and teacher Mikhail Kazinik. He visited orphanages in different regions of Russia. The kids were literally screaming with joy and later they started writing letters saying that just two hours in the company of Mikhail Kazinik had changed their life... We are very grateful for this initiative. In the Khoroschool, we held a second Christmas Bazaar last December with the children’s parents and grandparents, both young and old taking part. Preparations lasted for a whole month. It was a great party and the general mood there was fantastic. - How much money did you raise? Nearly three and a half million rubles. A hefty sum, you will agree. 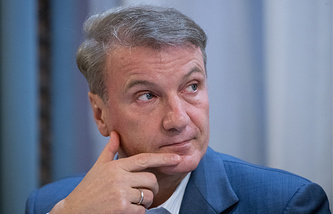 The school uses its own internal currency, called Khoroshka. - What’s the exchange rate? Fifty Russian rubles, if I’m not wrong. - Falls short of the dollar. But the rate of inflation against the ruble is zero. The Khoroschool has its own parliament where the children decide on their own who deserves the transfer and how much. That’s what democracy is about! Sometimes the voting produces quite unusual decisions. The kids may choose recipients none of the adults would’ve ever decided to support. They invariably donate to animal protection funds. For instance, shelters for homeless dogs and cats. In 2018, part of the sum went to pay for hospital clowns. They are wonderful actors – volunteers, who twice a week visit children in hospices and hospitals and help patients to cope with grave illnesses. Haven’t you ever seen them in action? It’s a great show! - We’ll get back to education projects a little bit later. Right now, I would like to finish up the opening subject of our interview. We already know that you don’t lend money to other people. Have you ever borrowed money? - For instance, to buy your first car? I earned the money for my first car myself, when I was a law student at the Omsk University. Each summer, I went with a team of students to work as a builder in the north of the Tyumen Region, where I earned a pretty penny. Anything that came our way. First we built cowsheds, and then semi-detached houses. To tell you the truth, none of us was competent enough. There was a team of Chechen guest workers next door. Quite often we went to see what the guys were doing and then tried to follow suit. We were not always very successful. I recall that on one occasion we went to the place where we’d worked the previous summer. A local family – a young female school teacher and a doctor for whom we’d built a house - complained to us that winter winds had torn off the roof from the outhouse nearby. We went to see what was wrong only to find out we’d failed to fix the sheet of roofing. What a shame! Naturally, we apologized and put everything in order. This amusing incident was an exception, of course. By and large, we worked well and were paid decently. Plastering the ceilings and walls was a great problem. On the face of it, the job looks easy, but in reality, it was exhausting. Some of our fellows didn’t stop complaining. During the first season, it was terrible waste of time and effort. Then we got word that there was a team of female students from the University’s departments of psychology and philology in a neighboring district. We asked them to lend a helping hand. They did great stucco and plastering work, finishing the job in just two days. Had we worked on it, we would have surely needed no less than two weeks! The building team usually hired only those who studied well. We took our exams ahead of time and left for the whole summer. Therefore, I didn’t have to borrow from anybody to buy a car. - Do you remember your first car? The first front-wheel drive model from AutoVAZ, a Lada Samara coupe. In my younger years, I was very fond of motor racing. Also, I worked as a night watchman at a garage part-time. During my night shifts, I learned how to disassemble and assemble cars. So, within a short period, I got to know My Lada’s engine like the back of my hand. - When did you get your driver’s license? Very early, when I turned 16. These days I seldom get behind the wheel. I haven’t got the urge. I must’ve calmed down, I think. Such things do happen in life quite often. Tastes, hobbies and interests change. For instance, there was a time when I loved firearms. I was an enthusiastic hunter. Now that feeling is completely gone. I can no longer imagine myself shooting a wild animal. I still may go hunting game birds once in a while, but I can no longer take aim at a big animal. - Nevertheless, you did manage to collect Big Five game animals, including a lion, an elephant and a rhinoceros, didn’t you? No. I didn’t even bother striving for that goal. You know, when I was still fond of hunting, everything was slightly different. Or greatly different, I should say. These days it is no longer a duel between a human being and a strong, cunning beast, but in fact live-target practice. My first hunting experience was back in my childhood. I recall the day when my dad took me on a hunting trip to the woods after I finished my third year at school. He promised: “I’ll buy you a gun, if you finish the seventh grade with only excellent marks.” Can you imagine that? That was a real goal for a ten-year boy to strive for. I studied very hard just so I could get a real gun! My father was an avid hunter and his hobby became mine. Let me say this once again: hunting then was for real. You took a simple gun, put skis on and went out into the forest on your own. Nowadays, everything is at your disposal - hunting towers, sniper rifles with a 20X zoom lens and forest rangers who drive the poor beast into the line of fire… I find no pleasure in this anymore. - When did you give up your hobby? Fifteen years ago or so. Since then I’ve always gone hunting armed only with my photo camera. Although I’ve repeatedly found myself in the company of hunters since. I even flew to Africa. After each trip, I bring home thousands of snapshots, then select the best ones and have an album printed in several copies for each member of the hunting party. I prefer these hunting trophies a whole lot more. - Motivation is important for each human being, isn’t it? I have to be interested. I can’t do anything mechanically. I definitely need some sort of challenge, some goal to strive for. I merely put the spotlight on a certain problem this way. I never try to stun the public at large on purpose, but I believe that sometimes it is important for everyone to remember the somber sides of life. - Not all of your ideas and creative concepts have earned public support. Does this you upset you? To tell you the truth, I’m not upset about the lack of feedback at all. It is important for me to share my ideas and to say what I think. If this sparks some kind of discussion, it will be great. Nobody is obliged to agree with me. I’m not trying to be liked by the general population or win public acclaim. That’s a politician’s job. I often foresee a reaction to some statement or proposal of mine. Any point of view inevitably affects a certain number of people. Especially when global processes are at stake. A conflict of interest is inevitable, but this is normal. The conservative part of society is against any change, which is life’s credo. Those who do not understand what it is all about join those who disagree out of sheer solidarity. I can see nothing tragic in the very instance of a dispute as such, and I’m skeptical about any forecasts concerning the future. It is far more important to have a civilized and professional discussion. Time will put everything in its place.